Cut off date for sign up is Dec. 1. 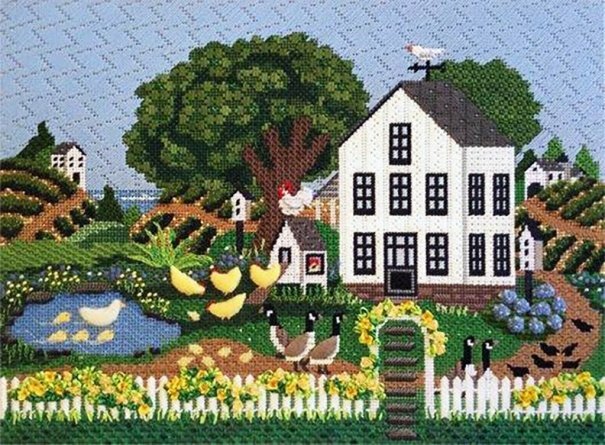 Patricia will stitch this fantastic piece from Melissa Shirley with her beautiful pattern designs. Class Fee: Please call the shop. Due by Jan. 23rd. Kit Fee: Please call the shop. $250.00 Deposit is required at sign-up. Please read our workshop class policies. Tony will write a spectacular, personalized stitch guide just for you! Your very own canvas from Chandal will be sent to Tony. From it, he will develop a unique stitch guide filled with fabulous patterns and creative techniques. 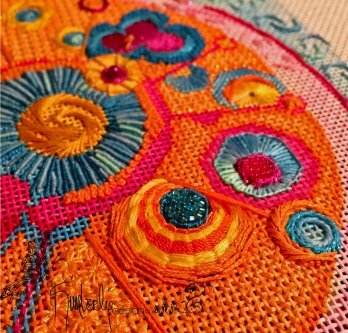 Fantastic thread and embellishment choices will also be incorporated. Canvas must be purchased through Chandail. Note: A few spots remain! If you can join us we need your canvas no later than Saturday, Jan. 12th. Class Fee: Please call the shop, due by Feb. 2. Kit Fee: Based on Tony's stitch guide and his thread list. $250.00 deposit required at time of sign up. Canvas size 15 x 11" on 13 mesh. Design by Melissa Shirley. Class Fee: Please call the shop. Due by Feb. 23rd. 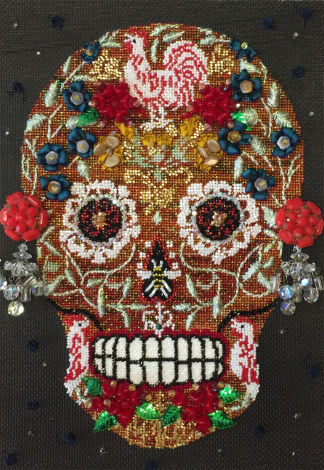 By popular demand, Sherry is coming back to Chandail to teach her Autumn Sugar Skull that includes ribbon work and an awesome collection of beads. Check out her dazzling earrings! 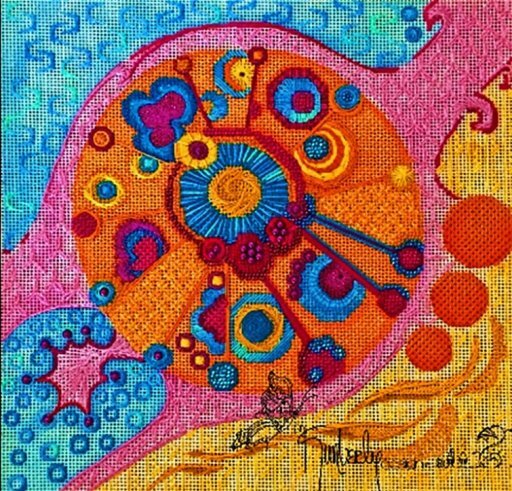 Canvas design by Mary Lake-Thompson for Melissa Shirley Designs. Class Fee: Please call the shop. Due by March 27th. 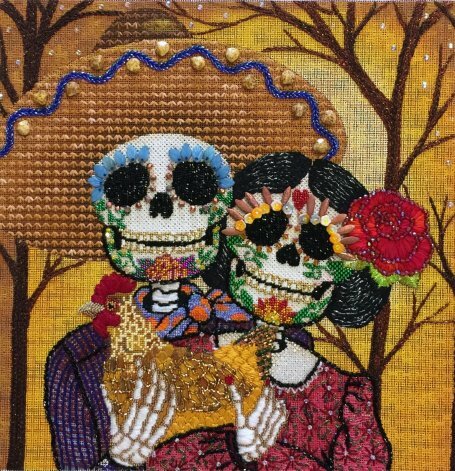 Sherry has incorporated beautiful stitch patterns and a wonderful assortment of bead types into this fantastic Day of the Dead couple design. 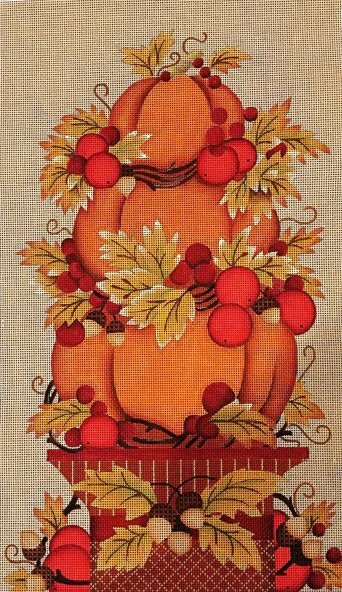 Canvas Design by Love You More Needlepoint Designs. Class Fee: Please call the shop. Due by April 3rd. Tony states: "Back to Basics, Level 2 is the second in a series of classes Back to Basics The Right Way, the object of which is to explore all the aspects of good canvas embroidery technique in a sequential order to strengthen stitching technique. This class picks up where Level 1 left off by including more involved straight stitches, diagonal stitches and composite stitches. 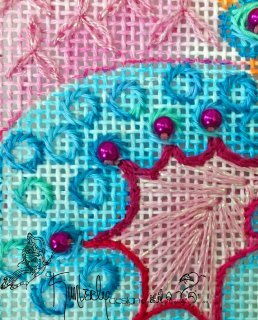 Learning different types of chain stitches, more plaited stitches, variations on wrapped stitches, traditional and non-traditional Turkey work, variations in pulled work and black work, options for beading, and much more will fill a new reference notebook. Participation in Back to Basics I is a requirement for participation in this class." Class Fee: Please call the shop. Due April 30th. $250.00 Deposit Required at Class Sign-Up. Sandy is coming to teach a beautiful beaded bracelet! Class Fee: Please call the shop. Due May 28th. 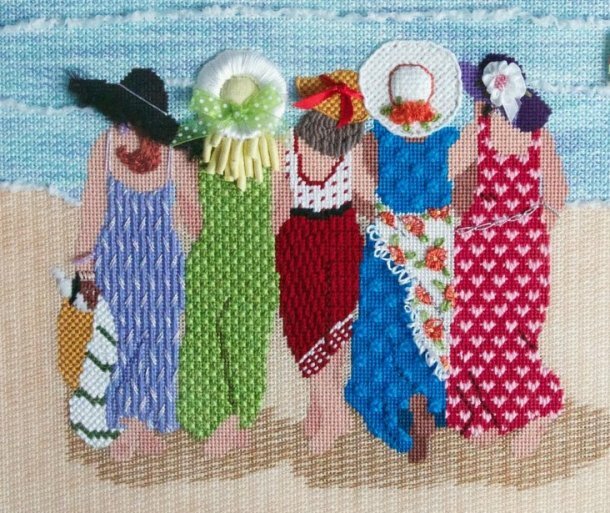 The original beach ladies! Sandy will teach her amazing work used on the ladies hats and hair plus all the perfect stitches, attachments and techniques for their cover-ups. The design is line drawn by Sandy. The finished design area is about 11.5” x 13”. Class Fee: Please call the shop. Due May 29th. Choose a canvas from Chandail and let Patricia design her fantastic stitches and threads using your very own canvas. VERY IMPORTANT: Your canvas must be in hand at the shop by March 1. Call soon, very limited space. Class Fee: Please call the shop. Due June 13. Kit Fee: Based on stitch guide and threads. Patricia will teach one of her beautifully stitched projects. Check back soon to see the piece! Class Fee: Please all the shop. Due August 28th. Laura has stitched this fabulous Rebecca Wood design amazingly. Join us so you can have a showcase piece that displays your love for all things Texan! Class Fee: Please call the shop. Due September 11t h.
Do you need some extra help from Tony? 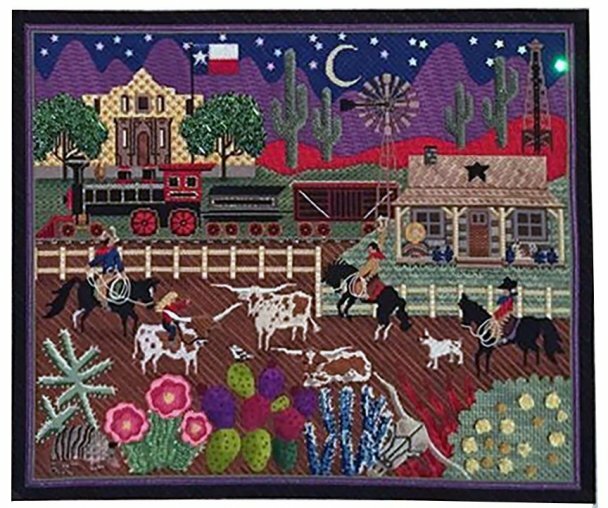 Tony will be here to answer your questions and to demonstrate his stitches and techniques using your embellishment canvas or project piece. Don't forget to bring your stitch guide! Class Fee: Please call the shop. Due Sep. 31. $150.00 Deposit is required at sign-up. Tony will write a spectacular, personalized stitch guide just for you! Your very own canvas will be sent to Tony. From it, he will develop a unique stitch guide filled with fabulous patterns and creative techniques. Fantastic thread and embellishment choices will also be incorporated. Please Note: Your canvas must be in-hand at the shop 4 months prior to class time. Canvas must be purchased through Chandail. Class Fee: Please call the shop. Due by Oct. 1st. Join us for an outstanding class piece! Kimberly incorporates beautiful threads and techniques into her own gorgeous designs. Peak at these close ups of the areas! 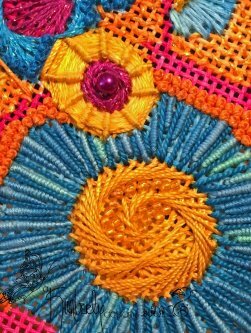 See the gorgeous patterns Kimberly has chosen that you will learn how to do in class! Class Fee: Please call the shop. Due by October 16th.